Global Positioning System (GPS) technology is a space-based radio-navigation system consisting of a constellation of satellites and ground stations used for monitoring and control. Between 24-32 GPS satellites orbit the Earth at an altitude of approximately 11,000 miles providing users with accurate information on position, velocity, and time anywhere in the world and in all weather conditions (FAA). GPS is operated and maintained by the Department of Defense. There are also other systems available and operated by other countries (i.e. Galileo operated by the European Union, Glonass operated by Russia, and QZSS operated by Japan, to name a few). The GPS receiver calculates its position by precisely timing the message signals sent by the GPS satellites (typically between 5-9 satellites might be utilized in surveying applications). The receiver measures the transit time of each message and computes the distance to each satellite. Geometric trilateration is used to combine these distances with the satellites' location to obtain the position of the receiver (Wikipedia). 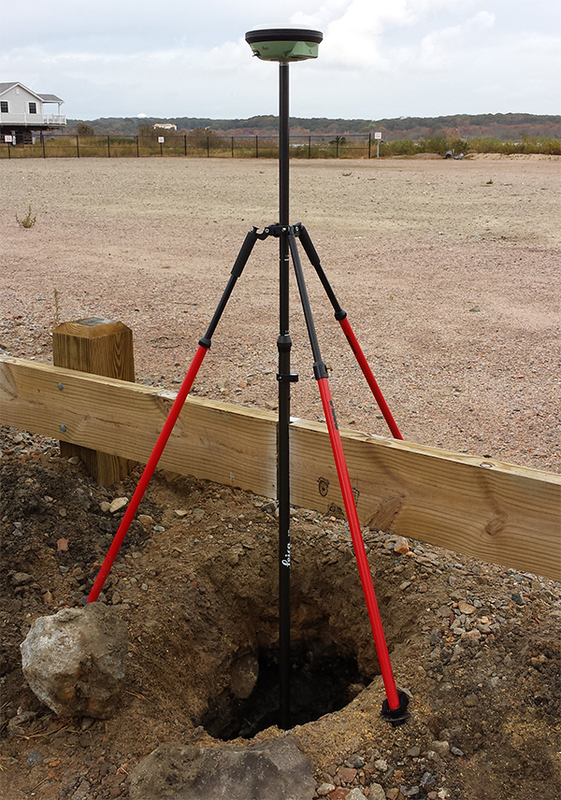 We utilize a Leica GS 14 Smart antenna Geodetic Receiver that is capable of determining horizontal and vertical positions within 8mm + 0.5ppm (or approximately 0.03'). Post-processing this data , both in-house utilizing special software and via NGS services such as OPUS, may further increase that precision.